Our host this month was Beth. Present were Beth, Betty, Carla, Colette, Jane, Janet, Jolene, Linda, Michèle and Shirley. All were present for this last meeting of 2011! To put us in the mood of an English countryside in this novel, Beth served some wonderful english cheeses and a great ginger chutney. She also prepared a delicious English trifle. Thank you Beth. 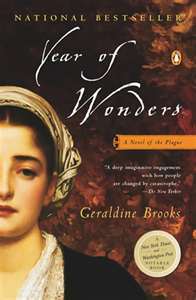 The book choice this month presented by Carla was Year of Wonders by Geraldine Brooks. Ms Brooks was originally an Australian journalist who worked as a foreign journalist for both Australian newspapers and eventually also American newspapers including the Wall Street Journal. She worked principally in the Middle East. She eventually became an American citizen. Ms. Brooks has written 6 books, the last four are fiction. She won the Pulitzer Prize for fiction in 2006 for her novel March about the March girls' from Little Women absent father, gone to fight in the American Civil War. Year of Wonders is a historical novel, taking place in the village of Eyam in Derbyshire in 1665-1666. When the plague arrived in the village, the Rector convinced the community to quarantine itself and contain the plague within their community avoiding it from becoming widespread in England. The story is narrated by Anna Frith, the housekeeper of the Rectory. The other main characters are the Rector Michael Mompellion and his wife Elinor. They together, work tirelessly to tend to the needs of the sick and help those still healthy. There are several other characters including Anna's father Josiah Bont a miserable, mean person, his wife Aphra, Anna's selfish step-mother; Anys Gowdie and her mother Mem, the village herbalists and midwives and Anna's boarder, George Viccars. All members felt that there was some excellent character development by Ms. Brooks, both for the major persons such as Anna, the Rector and his wife Elinor and the more minor characters that were complex and interesting. All members agreed that Ms. Brooks described very well the atmosphere of 17th century village life, of a mining and agricultural community. She wrote in a language of the time and did not shrink from describing the realities of life in that time, the fragility of new borns, the filth, the never ending chores and work of both men and women, the belief in the wrath of God and also the superstitions and panic that can spread because of ignorance. Some of us found parts of the story wrenching and difficult to read. When Anna descends into the lead mine, the tension that is created can raise your blood pressure and even though you know that Anna is a main character and narrator you wonder if she will come out of the mine alive. The lynching of Anys Gowdie is extremely well described. The hatred and desperation leaps off the page. All members enjoyed the book but several of us were surprised by the ending, the last 50 pages. Michèle read a review taken from Goodreads that gives the book 4 stars for the first 255 pages and one star for the last 50 pages. Though some were pleased by the "happy" ending many of us felt that there was a definite disconnect with the story itself and that the description of how Anna turns her life around and where she finds herself is not at all true to the realities of the time in which the story is situated and so well described in the first 255 pages. Beth read a part of a hymn written by Martin Rinkart in the 16th century that she feels describes the message that Rector Mompellion tried to pass on to his flock. Historical novels always allow us to acquire knowledge of a past events and places and we have all enjoyed Year of Wonders for this reason. Thank you to Carla for a good choice. I loved seeing "my hymn" reprinted for everyone. I thought afterward that we got so engrossed in our lively discussion about the ending that we never touched on another intriguing theme in the novel: the struggle to sort out by observation and trial and error where and how the plague might be spread and stopped, as opposed to obsessing about why God sent it. Elinor and Anna each think about this, and try to work together to map the outbreak and find herbal medicines. Anna comments at one point that they are used as farmers to observing conditions and trying different practical methods or solutions with their crops and animals. However, she realizes that in their panic, grief and prayers for help, they have not used the same skills for their own illness. Presumably, God's gifts of reason, science and other "wonders" could be used here too. Thanks, Michèle. Great as always. I see you avoided mention of the rather heated (but good-natured) debate about Rector Mompellion's character and the treatment of his wife!